How distinctive is South Australia after all? South Australia has often been represented as "different": free of convicts, more enlightened in its attitudes toward Aboriginal people, established on rational economic principles, and progressive in its social and political development. Some of this is true, some of it is not, but mostly the story is more complex. In this book, eminent historians explore these themes by examining some key "turning points" in South Australia's history. Henry Reynolds considers the question of Aboriginal rights to land. Bill Gammage illustrates the nature of Aboriginal land management. 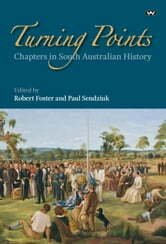 Paul Sendziuk unravels the myth of the colony's convict-free origins, while Robert Foster and Amanda Nettelbeck reveal a surprisingly strong sense of "nationalism" in colonial South Australia. Susan Magarey traces the histories of two crucial events in the advancement of women. Neal Blewett examines the political innovations of Don Dunstan. Jill Roe looks at life in the country in twentieth-century South Australia, and Mark Peel life in the city, in particular the migrant experience after World War Two. Finally, John Hirst asks: "How distinctive was South Australia after all?"